Over the years, I have heard the idea that luck means being prepared when opportunity knocks. It may seem like an obvious statement, a statement of fact or some self-evident truth but it certainly seems to be the common belief that luck has more to do with something like winning the lottery. Yes, we do have lottery winners in the world but the vast majority of successful people did not hit the jackpot; they tackled the entire issue of being successful by working hard. Ah, hard work. Hmmm, we come back to the idea of being prepared. So, just how long has this idea been floating around? [chuckles] While we think we may have hit upon something, it's obvious those Romans knew a thing or two about luck. The point about all this is that while we may think of luck as being associated with winning the lottery or setting off the bells when we pull the handle of a one-armed bandit, the true nature of the beast is connected to the simple idea of being ready when the proper moment arises. For instance, there's a job opening at the local hospital for a doctor and the position pays $200,000. That's a lot of money. Is the guy who gets it lucky? He's the one who went to medical school, studied hard, passed the exams and did his internship. Lucky? I think he was quite simply prepared for the opportunity when it presented itself. Go down the list. Is Tiger Woods lucky? The guy practises like crazy. Sure he's got talent but undeveloped talent is undeveloped talent and being good involves a lot of hard work. Is Bill Gates lucky? He was lucky in the sense he was in the right place at the right time but, and this is the big but, he had what IBM wanted. If he hadn't had what IBM wanted, he would have completely wasted the "right place at the right time" and would have spent the rest of his life like us common Joes. Ms. Thatcher may sound a little conceited, maybe arrogant might be the word but she does have a point. You work hard; you get the brass ring. Well, maybe you do deserve it. Tiger Woods deserves it; Bill Gates deserves it. I can't find out whether the story and the quote is 100% accurate but it does make a great tale and exemplifies the connection between work and so-called luck. Anonymous proverbial saying sometimes attributed to Samuel Goldwyn and various other figures, including Thomas Jefferson; variant: "I've noticed that the harder I work, the luckier I get!" Ever had somebody say to you, "Boy, are you ever lucky"? Ever think of what they may be talking about? You own a nice car; boy, are you ever lucky. You went on a nice vacation; boy, are you ever lucky. You just got a promotion; boy, are you ever lucky. Don't you just want to slap them silly? Luck, my eye. You worked hard and you got your reward. However, I must take a moment and acknowledge that for some, there does seem to be bad luck. Okay, it looks like bad luck and we can argue whether their bad luck is really the result of bad choices. I guess though people will always attribute good fortune to that stroke of luck. With the randomness of the universe, I suppose there is no other way of explaining how some truly amazing coincidences crop up in our lives. Chip Denman, University of Maryland. Luck is what happens when preparation meets opportunity. The harder I work, the luckier I get. I have not failed. I've just found 10,000 ways that won't work. Gee, this seems like a Tony Robins type of moment where we dust off the story of The Little Engine That Could. Rah rah siss boom bah. Nevertheless, I would say that statistically speaking, hard work, getting prepared and persisting seem to be the way to go. Yes, there will always be the prize winners but as I say, "statistically" that isn't something I want to bet the farm on. This dates back to, if I remember correctly, the early 80's. 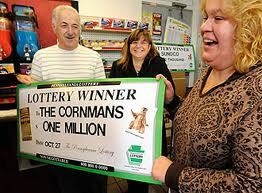 A couple in Pennsylvania mortgaged their home and sold all of their possessions to buy tickets in the state lottery. I saw a picture of the two of them sitting on the floor of their living room now devoid of any piece of furniture but awash in lottery tickets. There were the two of them grinning for the camera betting the farm on winning the big one. I remember that the article had said the two of them had managed to amass $90,000 in tickets. I forgot all about them but then, about 6 months later, I discovered this tiny follow-up article in a newspaper. I'm sure you can guess the results: they had won $25,000. Okay, they didn't lose everything but that did leave them $65,000 in the red. And they now had to pay off the mortgage they had taken out on their home as part of putting the original ninety thousand together. [chuckles] It certainly seemed like a wild idea and just imagine if they had won? I'm sure their hands must have been shaking while they were checking their tickets. But, we come back to that age old adage: only bet what you can afford to lose. I'm not going to mortgage my house to buy lottery tickets so I guess I'm going to have to go back to my job on Monday and just work hard. [sigh] Okay, that doesn't have the same pizzazz as my picture in the paper holding up a giant cheque but at least I'm not going to end up in a house with no furniture and a big fat mortgage to pay off! Oh yeah, all with nothing to show for it. Ha! Chip Denman, manager of the Statistics Laboratory at the University of Maryland. Incorrectly attributed to Penn Jillette of Penn & Teller. 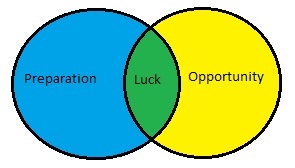 When the subject of luck came up, Penn would sometimes refer to a famous quote that frequently gets mis-attributed to him: "Luck is probability taken personally". The quote is properly attributed to Chip Denman (manager of the Statistics Laboratory at the University of Maryland).